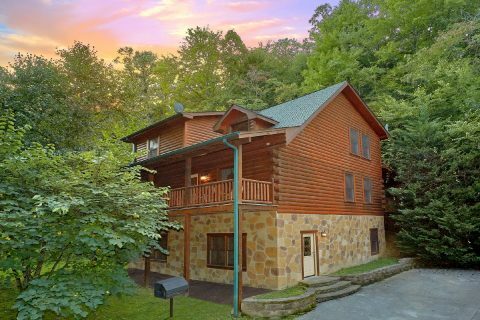 Reserve In The Heart Of Pigeon Forge Today! We really enjoyed our stay. There was a few problems with the cabin though. The ceiling was leaking when it rained in the living room and the theater room tv worked only half the time. Besides that is was great. Thank you for taking the time to leave a review, Amanda! We are glad that you enjoyed your stay with us! We wanted to let you know that the leak has been fixed since your stay. Also, the TV is working, it was just unplugged. We hope that you will book another stay with again soon! Very nice. Great location. Excellent for large group. Great Cabin! really close to everything. Does not have a gas grill and neighbors do not like any kind of noise at any hour of day or night. The cabin was excellent. I will definitely stay here again. The cabin was spotless & beautiful. Everything was right at my access, location very quiet. Pictures does not do this cabin justice. I would rate this cabin out of 100 a 💯.